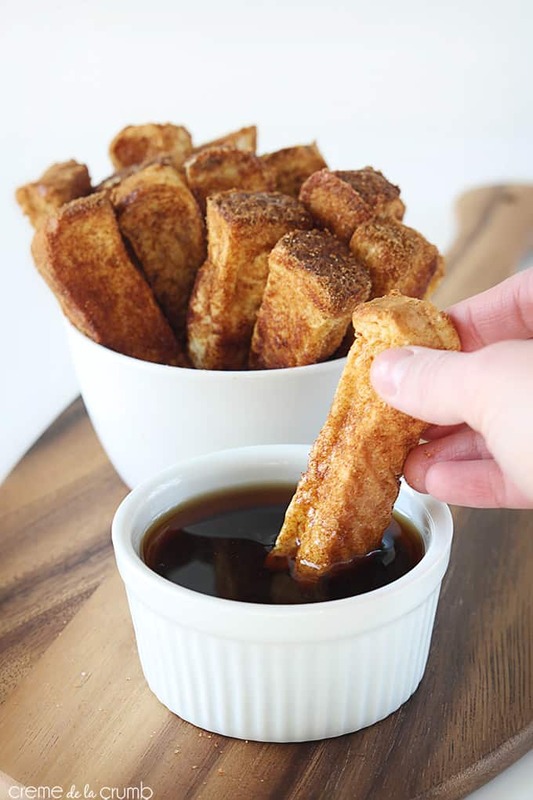 Cinnamon French Toast Sticks – Tasty cinnamon-sugar coated French toast sticks you can dip, dunk, and enjoy! A fun way to spice things up for breakfast! Before we dive into this recipe, I have to update you about my trip. Last weekend I was writing to your from Philadelphia, PA. We’ve taken a little jaunt down the coast and this weekend we are exploring The Outer Banks – the coastal part of North Carolina. Today we are in Kitty Hawk, I’m in love. I’ve already picked out the beach house I’m going to buy someday very very far away. Or… the ten houses I’d like to buy. I couldn’t pick just one. This place though? It’s like I stepped right into a Nicholas Sparks novel. Except, I’m already in love and I’m not recovering from some kind of tragic past or on a quest to find myself. But other than that, it’s pretty much exactly like Sparks. Since it’s the “off season” it’s not too busy around her and I love that. No big crowds and it’s nice and quiet. A little bit o’ heaven. Okay enough with the cheese, let’s get on to syrupy cinnamon french toast things. If we’re being honest, you could make this exact recipe minus the slicing of the bread into sticks but, what fun would that be? I’m a dipper. If there’s a way to make it dippy, I will find it. 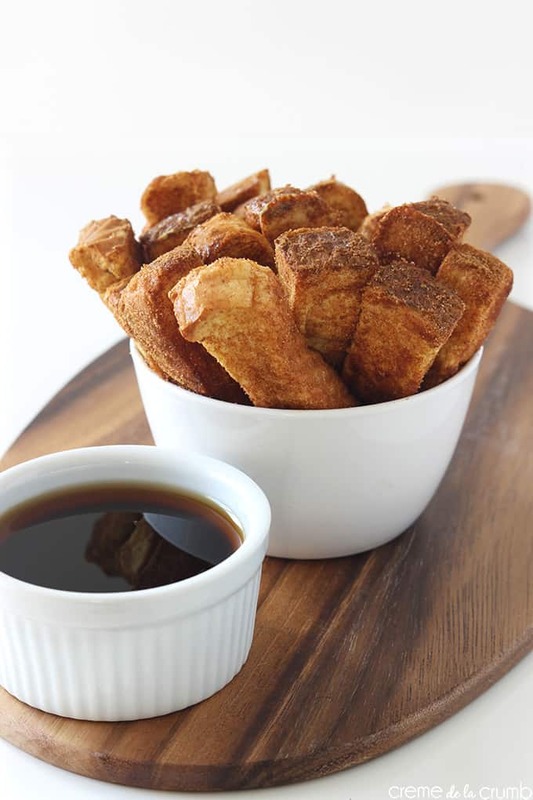 The yummy dippy sticks are a piece of cake to make. And aren’t they cute?? So cute. You can’t have a bad morning with Cinnamon French Toast Sticks. You just can’t. 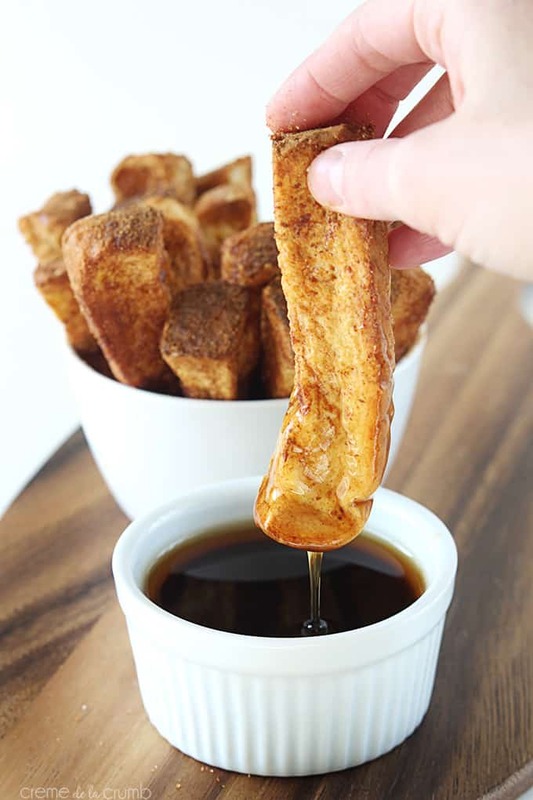 Tasty cinnamon-sugar coated French toast sticks you can dip, dunk, and enjoy! A quick and fun way to spice things up for breakfast! Preheat a large pan or griddle to medium high heat and spray with cooking spray. 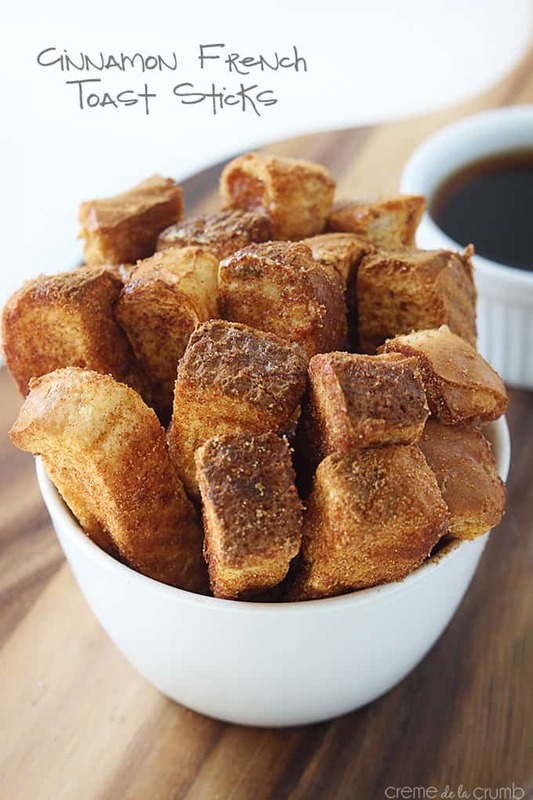 Cut bread into strips. In a wide bowl whisk together eggs, milk, and vanilla. In another bowl combine cinnamon and sugar and stir to combine. Dip sliced bread into egg mixture, turning to coat. I used to live in a beach house in NC for 2 years…it was THE most magical property I have ever lived in! I cherish those memories! Have a blast on your trip! Why are dunkable breakfast foods just so much better than normal?! These look so delicious, and so fun. Pinned! These look really good! I wonder…how would these work if they were made the day before and frozen to make a quick breakfast for the next couple of days? Hi Amanda! I haven’t tried freezing them myself, but I imagine they would actually do okay if you wrapped them in foil, or placed them in a zip lock bag, then froze them. You could probably just pop them in the microwave for a minute or two before serving! Is it supposed 2 tsp of cinnamon? 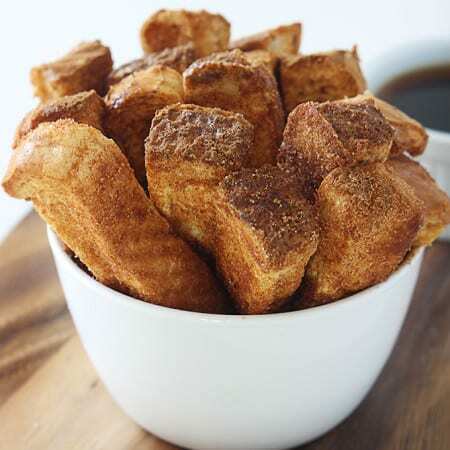 I just made these with 2 tablespoons and it seems like ALOT of cinnamon! I have them in the oven now and they are way more darker and coated with cinnamon then what your awesome picture looks like:). I have to say though, my son and I had a blast making them together. Regardless of if they only taste like a big spoonful of cinnamon;). Thanks for the recipe!!!! Tiffany your photography are fabulous. You certainly have an eye for that. And usually good photographers make good chefs/cooks too. 🙂 Great job. These were amazing! I made these today for some friends and they loved them! Way to go! Sounds like you did great. Thanks for sharing, Lillian!